The Huygens lander revealed a never-before-seen world in the landscape of Saturn's moon Titan. This view was created using images taken during the probe's descent, from an altitude of about 6 miles (10 kilometers). As NASA's Saturn-orbiting Cassini spacecraft begins its final eight months of operation, scientists are looking back at one of the mission's most dramatic moments: the landing of the piggyback Huygens probe on the huge moon Titan. Huygens touched down on Titan's frigid surface on Jan. 14, 2005, three weeks after separating from the Cassini mothership. It was a landmark moment in planetary science, mission team members said. Cassini and Huygens launched together in October 1997 and reached the Saturn system in July 2004. On Dec. 24 of that year, Huygens separated from the Cassini orbiter to begin a 20-day voyage toward the lander's final destination. At the time, little was known about the 3,200-mile-wide (5,150 kilometers) Titan; dense atmospheric haze kept the moon's surface features shrouded in mystery. 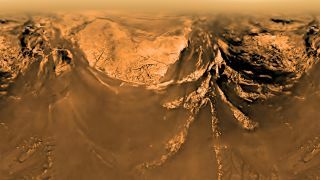 To an extent, the Cassini mothership has been able to use radar to peer through the haze from orbit, but Huygens' up-close photographic views were a revelation, mission scientists said. "The Huygens images were everything our images from orbit were not," Carolyn Porco, Cassini imaging team lead at the Space Science Institute in Boulder, Colorado, said in the same statement. "Instead of hazy, sinuous features that we could only guess were streams and drainage channels, here was incontrovertible evidence [that] at some point in Titan's history — and perhaps even now — there were flowing liquid hydrocarbons on the surface," Porco added. "Huygens' images became a Rosetta Stone for helping us interpret out subsequent findings on Titan." Titan is the only solar system object aside from Earth known to harbor stable bodies of liquid on its surface. But Titan's seas contain liquid ethane and methane, not water. Huygens also sampled the atmosphere of the huge moon while passing through, measuring winds and analyzing the organic chemistry of the unusual world. In the dozen years since Huygens touched down on Titan, Cassini has continued studying the moon from Saturn orbit during a series of flybys. The spacecraft has examined the clouds in the moon's atmosphere and analyzed the satellite's climate and seasonal changes. Cassini has probed the variation in surface features, including lakes, rivers, channels and reservoirs. Bizarre "magic islands" have been observed appearing and disappearing over time in one of Titan's northern lakes. The moon also shows signs of potential cryovolcanism, low peaks that may permit cold lava flows on the surface. "Cassini and Huygens have shown us that Titan is an amazing world with a landscape that mimics Earth in many ways," said Cassini scientist Alex Hayes, of Cornell University in New York. "During its descent, the Huygens probe captured views that demonstrated an entirely new dimension to that comparison and highlighted that there is so much more we have yet to discover," Hayes added. "For me, Huygens has emphasized why it is so important that we continue to explore Titan." The $3.2 billion Cassini-Huygens mission is a collaboration involving NASA, the European Space Agency and the Italian Space Agency. The venerable mission is nearing its end. In April, the Cassini mothership will begin its "Grand Finale" phase, a series of 22 dives between Saturn's cloud tops and the planet's innermost ring. Then, on Sept. 15, the probe will perform an intentional death plunge into Saturn's atmosphere, to ensure that microbes from the craft don't contaminate Titan or the icy moon Enceladus, two worlds that may be capable of supporting life.